After a hearty Eco Lodge breakfast of egg, tomato and what looked like bacon, a visitor arrived to see us. It was Jeevan Shrestha from the Himalayan Data Base Organisation. He was here on behalf of Elizabeth Hawley, to get information on our expedition. Now this is a very interesting part of Everest history, and let me touch on it quickly. As mentioned, Jeevan works for Elizabeth Hawley, who runs the Himalayan Data base, and the Expedition Archives of Mount Everest. Elizabeth Hawley was born on the 9th November 1923, in Chicago and educated at the University of Michigan. In 1959 she visited Nepal, which had newly opened its borders to foreigners, and a year later she moved to Kathmandu permanently. She found work with the Reuters news agency covering mountaineering news. As a correspondent for the Reuters in Kathmandu, Miss Hawley quickly recognized the growing popularity of mountaineering, so she began meeting, tracking, and filing Himalayan expedition reports. While she has never climbed a mountain herself, Hawley has been the best-known chronicler of Himalayan expeditions for over four decades. She is respected by the international mountaineering community because of her complete and accurate records, despite their unofficial status. The data cover all expeditions from 1905 through 2015 on more than 340 significant Nepalese peaks. Now 95, Miss Hawley is still confirming and denying summits from her home in Kathmandu and sharing her reports with alpine journals and mountaineering magazines around the globe. I was very keen to meet Elizabeth, but understood that, with her age, it might not be possible. To make matters worse, she had recently broken a hip in a fall. Once we had completed the documentation with Jeevan, Sean and I headed off in to town and started shopping for my gear. I had arrived in Kathmandu, with very little kit as Sean had informed me that it was very cheap to purchase. Most of the day was spent getting kitted out. From boots, to crampons, cold weather gear, jackets, and an ice axe. By day end I had it all and could not have cost me more than R2500!! Sean on a rickshaw bicycle! The streets and shops of Kathmandu are like nothing I have ever seen before! Although not a very clean city, it is a hive of activity with vehicles, motor bikes, bicycle and people everywhere! Unfortunately with this, comes pollution and most people wear mouth masks, protecting them from the air pollution. Having said this, it is a fascinating place and the local folk are great. No stress, or road rage, and certainly a very safe place to wander around as one wishes. Sean and I ate out most lunches and dinner, but we had been warned! Although I have enjoyed everything I have eaten so far, the food can lead to stomach disaster! Many a traveller have succumbed to a dose of “galloping gut-rot” when eating at local food houses on the streets of Kathmandu. Thursday evening we were kindly invited by Tim, an American who works with Mohan, to a local dance evening. The best news it just how “local” it really was! We were picked up at7.30pm and taken off in to deepest Kathmandu. After a short walk through the alleys and a dodgy lift to the 7th floor of what looked like an old warehouse, we arrived at the venue! The 3 of us were the only foreigners and for the rest of the evening we were treated as honored guests. The dancing and singing was special! So different to anything we had experienced before. At one point we were invited up on stage and introduced to the patrons. Sean gave a few short words and a kata was presented to us. We were invited up to dance and party the night away. The following afternoon was just as exciting! A friend of Sean’s, also an expedition leader, was getting married! Ronnie and his new wife, Elizabeth, were regular visitors to Nepal. 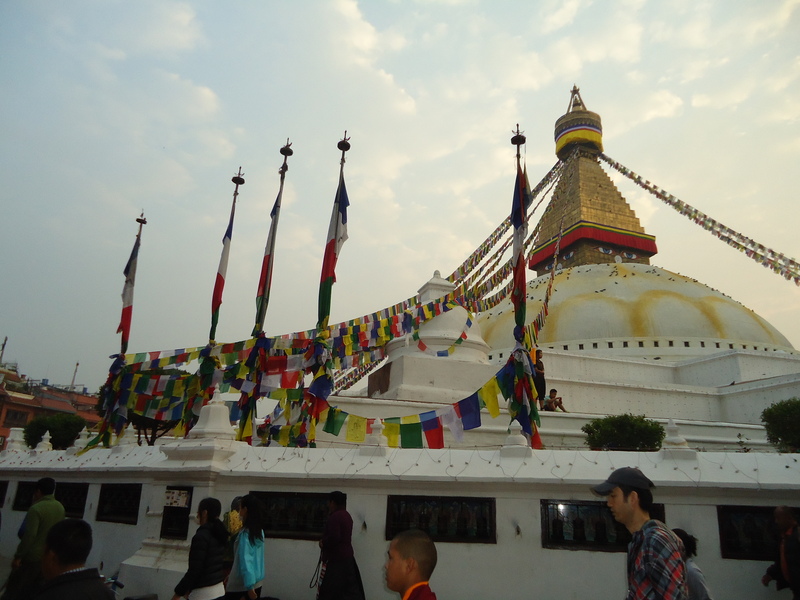 Having recently been married in Cape Town, they wanted a traditional Buddhist blessing in Kathmandu. We arrived at the venue in Thamel and witnessed the blessing, carried out by a Buddhist monk. We also met a lady by the name of Billi, who can best be labelled Elizabeth Hawley’s protégé. Billi has spent many years at Elizabeth’s side, assisting her with her Everest data base management. Saturday afternoon, and we checked out of the Eco Lodge and checked in at perhaps the top hotel in Kathmandu, the Hyatt Hotel! This was 5 star treatment and great to spend 2 nights in comfort before heading up in to the mountains! From here, it was off to the airport. The rest of the team, along with the 7 trekkers joining us for the walk in to base camp, had landed. We met them at arrivals and transported them back to the Hyatt Hotel. The full team was now in town! Sunday saw us doing last chance shopping, finalizing all logistics and packing our bags. Next morning 5.30am, we would be on our way to the airport for the flight in to Lukla! Gear ready to be packed! The time for departure had arrived! Sunday afternoon was spent with my family at our house in Kloof. After a fine lunch, I said my goodbye’s, and then set off for the airport with Belinda, Daniel and Jenna. Sean, Kath and Sarah-Jane got to the airport just after us and after checking our luggage in, we said our goodbyes to our immediate families. Never an easy time! Sean’s daughter Sarah-Jane is 3 years old and does not really want dad to head off for 10 weeks or so! It broke my heart to leave my family; perhaps the most difficult thing when embarking on an expedition of this length of time. With the goodbyes done, we boarded a Kulula flight to Jhb and settled in to the first leg of our journey. Waiting for us at OR Tambo was Francis, my warehouse supervisor in Jhb. He had the 3 equipment bags of the 3 other climbers and was at the airport to hand them over to us. Sean and I were going to take all this equipment through to Kathmandu, as it needed to be transported off to Base Camp before the rest of the climbers arrived. 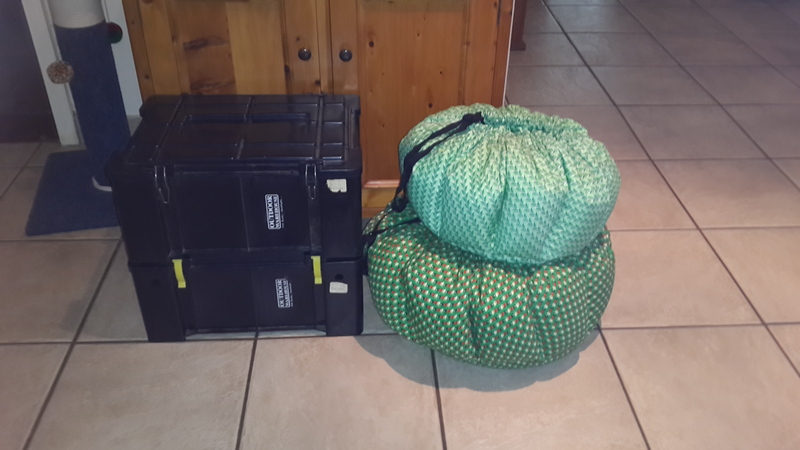 We now had 4 huge bags, each weighing in at over 40kg’s and, in addition, our own carry-on luggage! Now the challenge of getting it on to the flight without incurring additional weight costs! Well of course this was not to be. We were way over and at 30 US dollars a kg in excess luggage charges about to kick in, we decided it best to jettison some weight. I called Francis up and asked him to please come back to the airport. We met him outside and, on the pavement, we unpacked bags removing what we could. This excess luggage would be handed over to the 3 climbers and they would have to bring it over later. With 4 bags, still full to capacity, we headed back down to check in. With some sweet talking by Sean and more shuffling of equipment, the bags got checked through and we then proceeded to security. Problem number 2 as my Leatherman, which was not on me from Durban to Jhb, was now in my carry-on bag. No way would I be able to take it on the plane and no way was I going to lose it to be discarded by airport officials! I ran off and tracked down someone who would value it, or someone who I could give it to and perhaps get in back in a few months’ time! Enter Willem, a guy from Kempton Park. He kindly gave me his number and said he would look after it whilst I was away. Hopefully I get it back on my return! Thanks to Willem! Now on board Qatar, bound for Doha, Sean and I settled in for the 7 hour flight. A quick change of flights in Doha at 9am, and we were on our way to Kathmandu. We landed at about 4.30pm to a rainy Kathmandu. Of course, I then did something that I never do…… leave my bag on the plane! (Yea right…) Luckily I was just outside the plane and quickly retrieved it! Not something I want to do too often whilst here..!! Inside the airport, it took us a while to clear customs and immigration, but once through, we were greeted by Mohan, our agent from Makalu Adventures. Mohan is responsible for all the expedition logistics from Kathmandu. This includes Sherpa’s, foods, kitchen, travel and transport from Kathmandu to BC. All the luggage was loaded in to a car, and we squeezed in amongst the bags. From the airport and an hour later, we arrived at Eco Lodge, a bed and breakfast owned by Mohan and in the center of Thamel, the tourist mecca of Katmandu. After off-loading our kit, Sean and I headed in to town for a bite to eat and a quick look around. First up was a falafel from a street vendor (was this a good thing..??) and then off to “Tom and Jerrys”, a popular tourist bar / restaurant in the heart of Thamel. Over a couple of beers, we celebrated the long, rather demanding trip from South Africa to Kathmandu. We were here, not too stressed or worse for wear; and we had all our gear! Next up we bought sim cards and got our cell phoned connected. We now had coms with home and very quickly we were on to WhatsApp, catching up with family at home! Still hungry, Sean suggested we head off to Rumdoodle. This is a popular restaurant, frequented by climbers and Sherpa’s alike. It is known for its special membership club! Those climbers who successfully climb Mt Everest, are issued a membership card. On presentation of this card, the cardholder can eat for free at Rumdoodle, any time they wish! Now if I take the cost of climbing Everest and dividing it by the number of meals one may have at Rumdoodle, it would be the most expensive meals ever eaten!!! But being a card holder and eating for free at Rumdoodle is a special privilege afforded to those few climbers who have successfully summited Mt Everest. We tucked in to a few beers and steak, and then headed home for a well-deserved sleep!! Monday morning, after a late sleep in, after breakfast, we then met up with Mohan again. 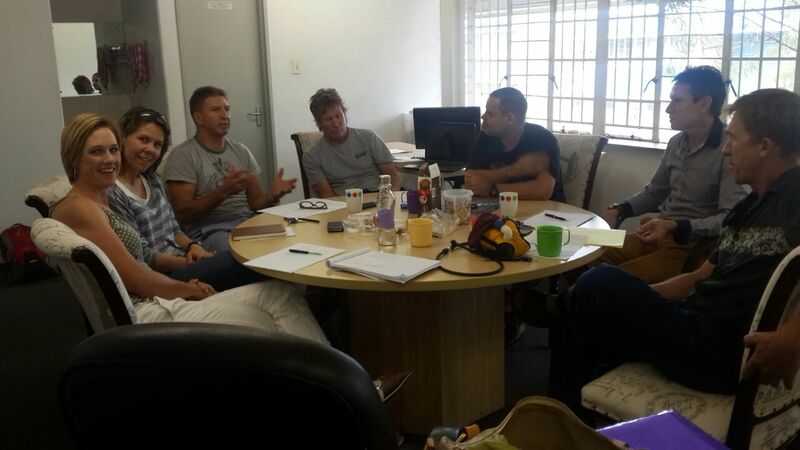 We were off to meet the Sherpa team, and discuss the camp set up and other logistics on Everest. At Mohan’s offices, we were introduced to the Sherpa team. The plan with the Sherpa’s is for them to accompany the climbers on Everest. Sean will be climbing alone, without a personal Sherpa. The rest of the team will have their own climbing Sherpa all the way to the top. With all Base Camp equipment now packed, and on its way to the airport for transportation to Lukla, Sean and I spent the evening relaxing, knowing everything was on its way! Before heading up to Jhb for the final packing, I went out and did a bit of shopping! This was for all my “comfort food”, the essential food groups that keeps one morale up whilst at BC! All the good old South African essentials such as Biltong, droe wors, Ouma Rusks, and plenty of chocolate! Everything was taken out of its outer packaging and put in to zip lock bags. This is going to keep me going for 6 weeks?? My trusty Wonderbags! – The first lot of kitting went into barrels. This included personal requirements like comfort food and other personal likes when on the mountain. (Chocolates, biltong, energy drinks, supplements for those climbers on the mountain, and other personal requirements for base camp) It also included a music system, screen for watching DVD’s, blow up bean bags, tents and a little climbing equipment. All this equipment was packed in to the barrels and shipped off to Katmandu. From here it would be trucked in to the mountain and then loaded on to yaks for the final trek to BC. – The second lot was the climbers actual climbing equipment for on the mountain. This was the important stuff. Crampons, boots, thermals, down suits, etc) This equipment would be carried in to base camp by the porters. – Thirdly, we had our day packs, the stuff required on the walk in to BC. This included water bottles, snacks, energy bars, warm clothing, camera and film equipment, etc. Light enough to make the walk in comfortable as possible. Pierre Jonker arrived, but the news was not good…! Pierre was involved in a motor bike accident and was not in good shape. He had pulled all the ligaments off the bone on his shoulder, and his Everest trip was no longer. We all felt very sorry for him as he is an Everest fanatic and crazy about the planned trip. Unfortunately, this years expedition was over for him. Molly and Sean deciding what stays and what goes! Sean confused as to what Wilmien is taking along! Next day, Sean, Kathy and I headed off to the Kenwood offices in Midrand. Kenwood had kindly sponsored us all the communication equipment required on the hill. Within a few hours, we were now boffins on the use of all 2 way communication. It was great equipment and all thanks to Kenwood and Leon for setting up the equipment and teaching us the ins and outs of its features. All packing was now done! With just over a week to go before Sean and I depart, it was back to Durban for some final arrangements and last minute packing. So I’m an “arm chair” adventure addict, especially when it comes to Mt Everest! I’ve read a large number of books on Everest, bought the maps, and “YouTubed” countless clips! An Everest Addict, just never been there….. until the opportunity came up. 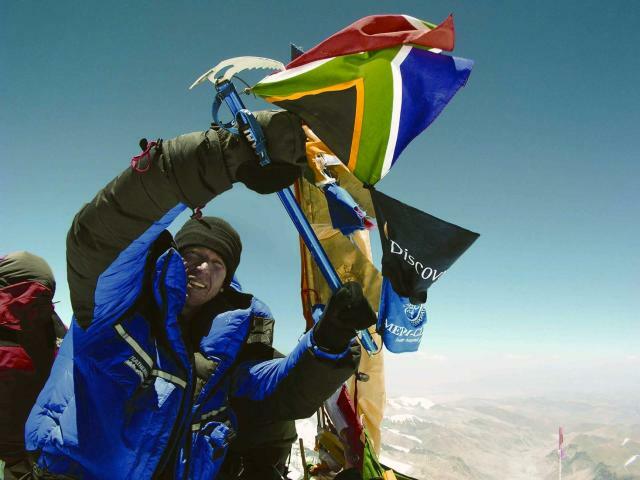 In early September 2014, I picked up off Facebook, that Sean Wisedale and a group of climbers from South Africa were planning a trip to Mount Everest in March 2015. It was time to “tata ma chance” and see if I could join them!! I knew Sean from years gone by and followed his many epic adventures on Facebook. The idea of spending time at BC, (Base Camp) and assisting the team in achieving their goal, was too great. I needed to make contact! Sean on the top of the world! I send a note though to Sean expressing my desire to join the team. I could assist with pre-departure logistics and contribute towards camp management and communications at BC. It was a long shot, but worth the ask! With Belinda’s blessing, I was free to go! She understands my need for adventure, a break from the mundane social matrix that engulfs our lives. 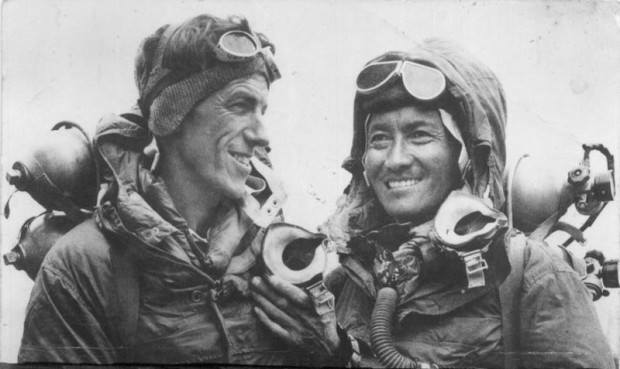 The first men to the top : Tenzing Norgay and Edmund Hillary.